I've been a martial art teacher for 18 years. I can teach you many kind of martial arts and inner body training such as a meditation. I'm a part time samurai and ninja! If you like martial arts, lets practice together! Feel free to ask me questions! Highly recommend Jun's class! He is very patient and knowledgeable in martial arts! Multi talented! It's one of our best experience in Tokyo! Would definitely go back if I have the chance! I enjoyed this session very much. Everthing seemed new. From warming up to throwing the shuriken. 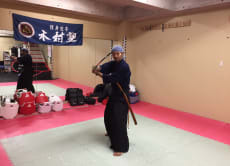 Jun taught me a different way to take out and putting in back the sword. Not easy though but Jun explained it by doing a little demonstration. He also taught me that not everything is about physical strength. Mastering a proper technique is vital. Especially when throwing the shuriken. Again I can relate some of the movements into my daily routine which may help me to avoid injuries and strengthens core muscles. When I showed photos of me attending this class to my friends, they all mostly have same view. Awesome experience!! And it is Awesome!. Thank you Jun. I have a new hobby now. Really recommend to all the girls and women who seek different kind of holiday. Love it..
A real Samurai and Ninja experience from an amazing teacher... a true warrior teacher who is also friendly and fun, an authentic experience... not a tourist trap! Jun is patient and joyful and really connected with my son Miles (who has a lot of energy and difficulty focusing). Thanks to Jun's gentle guidance miles learned a lot about samurai swordsmanship and ninja techniques like shuriken and throwing knives, and got to make his own! Even despite the language barrier the teaching was effective and clear and safety a top priority. Miles said it was a highlight of his Tokyo experience! Jun is very knowledgeable and is an excellent instructor. We had no prior experience but still had a great time. Private classes away from all the touristic areas. Highly recommended!